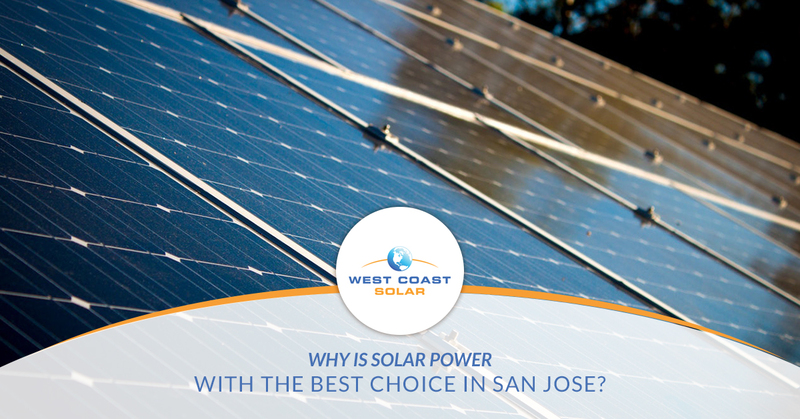 Why is solar power the best choice in San Jose? Want to reduce your utility bill? Looking for an alternative to fossil fuels? West Coast Solar believes that renewable energy is the future. It’s non-exhaustive, clean, and available to anyone with a collection system, such as solar panels designed for your home or business. These panels convert light into usable energy. A byproduct of using green energy to power your home, car, business, or anything else that uses energy is the positive effect it will have on the environment. The air and water pollutants caused by fossil fuels have been negatively impacting not only the earth but also the inhabitants: you and your family. West Coast Solar wants to share some reasons why solar is the best choice for your home and your future. The initial investment for solar energy can be a barrier for some, but if you look at the savings over the lifetime of using green energy the investment pales in comparison. Those who invest in solar power see their utility bills cut back substantially, and in come cases, solar power homes receive credit from their energy service provider for not using the fossil fuel alternative at all. Renewable energy is a relatively new technology, but it’s proving itself as a reliable and sustainable source of energy. This means research is ongoing and constantly making the technology better. Whether you’re looking to invest in your own solar power design, or you’re wanting to upgrade your current solar panels, you should know green energy is the future. Unfortunately, a handful of known health conditions are caused by air and water pollutants. Those pollutants can be tied to fossil fuel energy byproduct, such as carbon dioxide and methane. How does solar power affect pollutants? Green energy like solar produces little to no pollutants, which has been recorded as substantially less than the fossil fuel alternatives. Want to save the environment and keep the future clean for your family? Go green. The sun and the wind are non-exhaustive renewable energy resources. Water is another renewable energy source. All three are sustainable and reliable. Exhausting fossil fuel energy sources is a common and real fear. An alternative, and an extremely positive solution to fossil fuels, is green energy. Green energy is relatively maintenance free. A solar power design requires the monitoring of panel integrity, battery effectiveness, and entire system efficiency. Otherwise, solar power once installed, remains low to no maintenance and provides energy at virtually zero cost to the environment. The return on green energy is a lifetime of sustainable and reliable energy. Many are concerned with the economic effects of switching entirely to green energy. How will those in the fossil fuel industry find new work? Are there enough jobs to employ the hundreds-of-thousands already in the fossil fuel industry? To date, hundreds-of-thousands are employed in the green energy industry. The most promising fact is that the higher the demand for renewable energy like solar power increases, the more jobs that have to be created to fulfill it. As green energy becomes more common, the price of production, installation, and overall cost will lower, which is another benefit over the long term. On a community level, the fewer people tap into the fossil fuel grid, the more they can invest in their neighborhoods, schools, and likewise. As green energy grows, so will the investments in the communities adopting renewable energy sources. Want to design your solar power system? Not sure where to start with solar energy? West Coast Solar has been serving the Northern California region for more than a decade. Our experience in solar installation, whether home or commercial, alongside our impeccable customer service gives us the advantage over all the other solar companies out there. West Coast Solar keeps solar simple. Check out our other blog posts online or give us a call today!